It’s a re-telling in a different context of Herman Melville’s novella “Bartleby, the Scrivener.” Many elements are the same: the story is narrated by an employer who hires a man named Bartleby who, for reasons unknown, suddenly stops working. My story, though, is set in a future version of Birmingham, Alabama, after an apocalypse event, and the boss is a scavenger of resources from the former city, trying to save his crew from a bloodthirsty, sorority girl mayor. As mentioned in the story notes, the idea for the title came from a student of mine who was having trouble with the unfamiliar word “scrivener” and so kept calling the Melville story “Bartleby the Scavenger.” I’d been wanting to write a dystopian tale, and I’d been wanting to write something set in my hometown, so the three things sort of collided—scavenger, dystopia, Birmingham. The rest was mostly working out the details of the world and the voice of the narrator. I didn’t do a ton of focused research. I looked into some demographics for Birmingham, checked on how old the buildings are in certain areas, and investigated the kind of government currently in place in the neighborhood The Brook is based on. I did some reading on the firebombing of Dresden, Germany during WWII. A lot of the background, though, comes from what I might call “ambient research.” Much of what interests me about Birmingham in general found its way into the story. Plus, a few years ago, I went on a post-apocalypse spree and read a bunch of novels about the end of the world and/or oppressive government, so I felt familiar with the genre. That’s an interesting question. There really is a lot of tender sadness and pity at the end of Melville’s story—his Bartleby has “preferred not to” engage in life, until he meets his end in jail, his face to the wall, even though the story’s narrator has tried various ways to reach out to him. I think we’re supposed to understand Melville’s Bartleby as a person who has seen the potential emptiness of modern life (the rumor is that his last job was at the “dead letter office”), and his job as basically a human Xerox machine seems to indicate that his personhood is caught up in, and crushed by, the machine of Wall Street. I guess one of the things that really interested me about the character of Bartleby was the question of whether there is any other way to interact with a system that treats people as if they are components in a machine. So, my Bartleby became a person who sort of floats above or outside the system. He definitely “prefers not to” do a lot of things, but it’s because he’s too content or optimistic or “good, man.” My conclusion about society may not be much different from Melville’s—I definitely feel the daily pressure to be part of a machine—but maybe my conclusion about how to react to it is distinct from Melville’s. But, of course, Bartleby still dies at the end, so maybe I’m just as pessimistic as Melville after all. – Was “Bartleby the Scavenger” personal to you in any way? If so, how? I think I have an inner Peighton who gives me a “productivity quota” for every day. Teaching at a community college means there are large classes, and several of them, and there are constant demands on my time. Then there’s writing and life and family and housekeeping to maintain. The feeling that something terrible will happen if I don’t get it all done stays with me. I guess you could say Bartleby’s sense of calm is something I wish I could achieve—but he’s just a little crazy, so maybe not the best role model. The constant battle between productivity and contentment does seem very personal to me. I’m actually working on a short story collection in which I take classic stories and give them a modern, often sci-fi, twist, much like what happens in “Bartleby.” In this collection, for example, I put a James Joyce heroine on a space station. I’m also working on a couple of other non-adapted short stories and am dabbling in screenwriting. A lot of my creative work is being channeled through the MFA work I’m completing with Spalding University’s Brief Residency program. Just that I’m very pleased “Bartleby the Scavenger” was included in this issue. I’ve long been a fan of the magazine and very much enjoyed the other stories for May / June. It’s great to be in such wonderful company. “Bartleby the Scavenger” appears in the May/June 2014 issue of F&SF. “The Shadow in the Corner” is an homage to the late HP Lovecraft. It’s my humble way of trying to play with the idea of making some of the standard tropes of horror work in the modern world. I sometimes seen “modernized” horror tropes that are attempts at subversion — “I defeated the vampire by shining a sun-lamp at him, because the lamp had the same wavelengths as sunlight” — and I always find that approach annoying. When you’re dealing with the supernatural, I feel like it’s a cheap ploy to treat it as if it’s bound by scientific principles. So I wanted to arm modern, competent, technological heroes with all the advantages that we have, lasers and computers and the internet and command of quantum physics, and still show them helpless in the face of Lovecraft’s Elder Gods. – “The Shadow in the Corner” is a story in the Lovecraftian tradition: was there a specific story, by Lovecraft or another writer, which provided any inspiration for yours? – Did you do any research for this story? – What is it about cosmic horror that you find so appealing as a writer? Well, I don’t know that it’s a theme I’ll be concentrating on going forward, but the idea that something can be so alien and incomprehensible that simply seeing it can rob a man of his sanity is a compelling one. 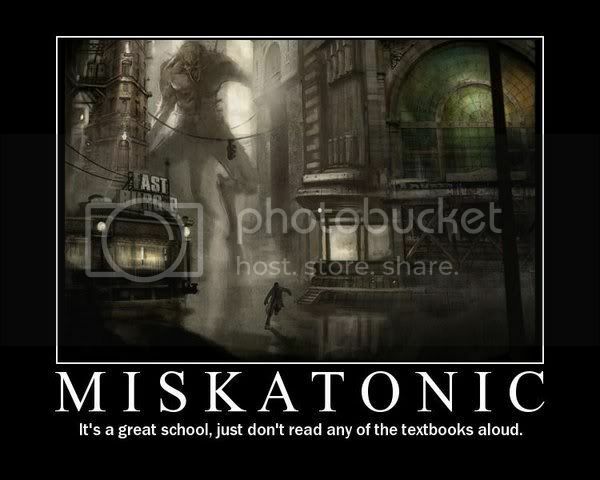 First, the notion I’d already had — inspired, truth to tell, by a cute image on the Internet, showing a giant thing chasing a man down the foggy streets of a small modern town, with the caption “Miskatonic – It’s a great school just don’t read any of the textbooks aloud” (http://img.photobucket.com/albums/v296/Mtrink/s640x480.jpg) — of Miskatonic University as a modern, real school, and what the history Lovecraft gave it would mean for people going there currently. I thought it would be a grim joke throughout Academe — but that those actually studying or working there would see absolutely no humor there. The second was the notion of Agrawal Narendra’s method of escaping the horror in his mind. That awful image, when it arrived, carried with it the notion that an eldritch Thing from another dimension might invade ours through someone’s awareness of it, but it was the terrible act of self-destruction that told me I had a story here. I had a lot of fun writing “The Shadow in the Corner,” and a wonderful experience with Gordon and Lisa and everyone I’ve had contact with at F&SF. It’s been a wonderful experience, and I hope to be able to come up with material to work with you all in the future. “The Shadow in the Corner” appears in the May/June 2014 issue of F&SF.